Published March 26, 2010 at 500 × 378 in Art. It was painted with acrylic paint. It is showing how in life we fight in a spiritual battle of good against evil. The green on the right side represents different people’s lives and how it takes time to grow and mature in the things of God, to understand who He is and what He is calling us to do. Our relationship with God is life long. The purple on the left is representative of the kingdom of darkness, which is evil. It is trying to infect and kill the people represented by the green. However these people are believers who have cried out to Jesus to help them and they have put their faith in Him so that Jesus is battling against the kingdom of darkness for them. The yellow, representative of Jesus, is surrounding the people, represented by green. 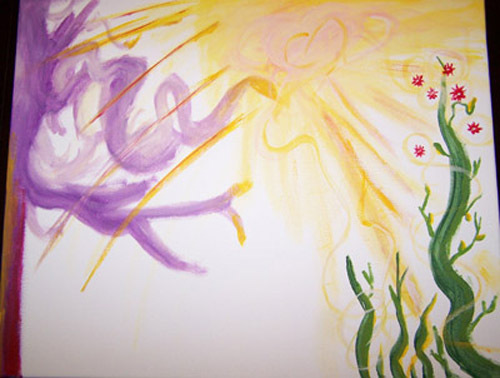 Jesus, represented by yellow, is also consuming and conquering the purple, which represents the kingdom of darkness. In fact the base of the purple has become yellow and red. The red represents the blood of Jesus, because it is by Jesus’ death on a cross that we can be forgiven for our sins. Jesus conquered death in this act of dying on a cross and rising again. So it is through all of this that the green on the far right has grown strong and tall and is now producing the fruit of God’s Spirit, which is love, joy, peace, patience, kindness, goodness, faithfulness, gentleness and self-control (see Galatians 5:22-23). The fruit of the Spirit is represented here by the red flowers which will spread their seed to others.